DataKit iOS Data Recovery is the most efficient tool to tackle every data problem on iPhone/iPad/iPod. It Applies the most advanced data recovery technologies to ensure you the easiest, fastest and safest way to recover your lost data. Numerous geeks recommend DataKit iOS Data Recovery as the most useful data recovery in the Geek Circle all around the world. 1. Three Recovery Mode: 'Recover Lost/Deleted/Formatted/Damaged Data from iOS Device', 'Recover from iTunes Backup File', and 'Recover from iCloud Backup File'. Above all, you can preview the lost files to check if they are the ones you want before recovery. 2. Recover everything you treasure, up to 19 different types of data, including Valuable Notes, Memorable Photos, Videos, Important Contacts, Call Log, SMS, iMessages, Safari bookmarks, Voice memos, WhatsApp Message, App Data and more. 3. Fix many iOS Errors without Data Loss. 4. Fully Support all iOS Device models,including iPhone X, iPhone 8 (Plus), iPhone 7 (Plus), iPhone SE, iPhone 6s (Plus), iPhone 6 (Plus), iPhone 5c, iPhone 5s, iPhone 5/iPad Pro, iPad mini 4, iPad mini 3, iPad Air 2, iPad mini 2, iPad 4,/iPod touch 6th gen., iPod touch 5th gen., iPod touch 4th gen,etc. 5. Compatible with iOS 11.0.3, iOS 11.0.2, iOS 11, iOS 10.3, iOS 10.2, iOS 10.1, iOS 10, iOS 9, iOS 8 etc. and work with the latest iTunes 12. 6. DataKit iOS Data Recovery can restore data in many common situations, including Deleted/ Damaged/ System Crash/ Virus/ Stolen/Jailbreak/iOS Update/ Forgotten Password/ Dropped in the water/ Factory Reset/Stuck in Black/White Screen, etc. 7.Fast data scan and analysis and versatile file preview, search & filter. To restore an iPhone with iTunes is super easy, But if you just want to restore some data from your iPhone or iTunes backup, you have to use this program. You can preview all your iPhone data and select those that you need to recover. 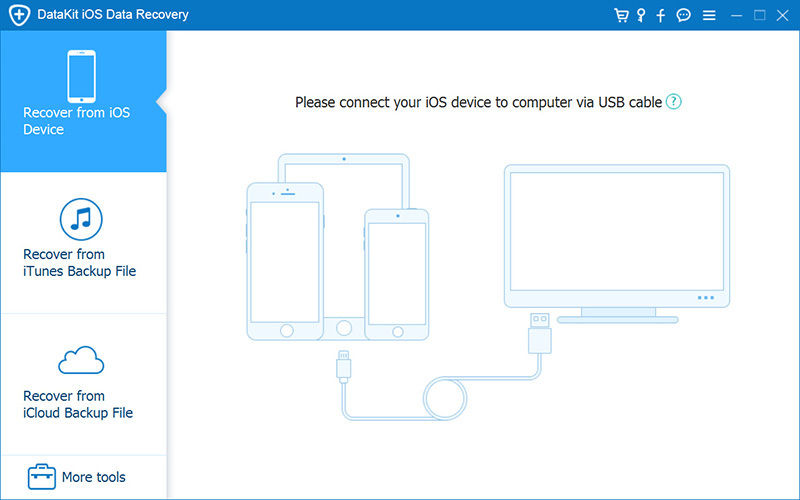 More than 1,800,000+ Users love iOS Data Recovery and you will do too.